LG unveiled its Optimus L series with a bang at last year’s Mobile World Congress, and then we saw three devices covering everything from the low-end to upper mid-range with the Optimus L3, L5, L7 and L9. Could this mean a new Optimus series? After the successful and well received LG Optimus G and Nexus 4, LG has the right momentum to get its traction back. The new series is probably an upgrade to the previous series. L3+, L5+, L7+ and L9+. 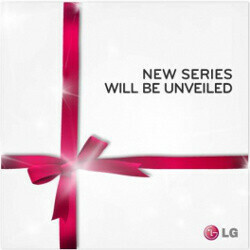 Notice the 'L' and '+' in the teaser image (thumbnail) from LG's fb page. OR... its just shows a gift wrapped in a ribbon!! It's still the L series but with upgrades like L3 II or L7 II and one new flagship. Wouldn't be surprised if they throw in a 7" tablet. Maybe they will unveil new WP series too..
with a portrait QWERTY ! Wow if we add LG's monster phone to the 2013 competition... what a hot battle between Sony, HTC, Samsung, and LG! Love my L9 makes it even better with no contract!